arteautoblog - the blog of l'art et l'automobile: They're Silver Arrows, Right...? So that story you’ve heard about how silver became Germany’s national racing color? Not really true. Pop open any book discussing Mercedes-Benz racing history and guaranteed that book will include the story about how, faced with overweight W25 racing cars, the Mercedes-Benz racing team decided to strip all the paint from the aluminum-bodied cars, thus setting the precedent for silver to become the German national racing color. Except, according to a handful of historians fighting corporate PR and decades of tradition, it’s all hokum. So let’s start with the facts. In October 1932, the directors of the Association Internationale des Automobile Clubs Reconnus – the forerunner to the Fédération Internationale de l’Automobile – decided that Grand Prix racing had become too fast and too dangerous so, rather than limit the size of competitors’ engines, they decreed a new formula for the 1934 season, essentially unlimited save for the 750 kilogram maximum weight, or about half the weight of most competitive race cars. Theoretically, according to Louis Sugahara, who wrote and illustrated “Mercedes-Benz Grand Prix Race Cars, 1934-1955,” reducing vehicle weight meant reducing engine size in an era before widespread use of durable lightweight alloys for engines; AIACR officials had hoped the weight limit would cap engine sizes at about 2.5 liters. That size instead became a basement for engine displacement among the various competitors. At first, Mercedes-Benz had no intention to join the fray. The automaker officially suspended its racing program in 1930 as the Depression took hold and as its SSK cars were nearing the limits of their potential. 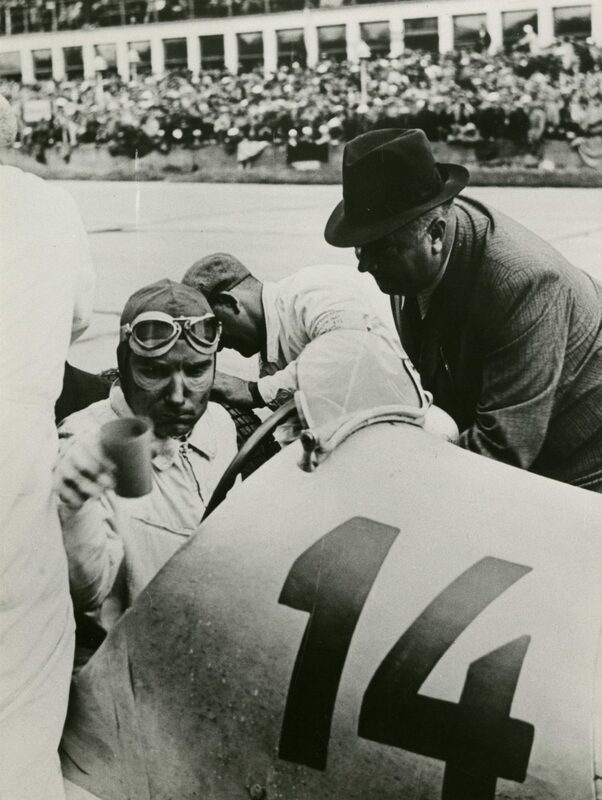 Alfred Neubauer, who helmed the racing program, reportedly considered leaving Mercedes-Benz to join his old colleague Ferdinand Porsche at Auto Union, but remained after Mercedes-Benz board chairman Wilhelm Kissel promised the company would soon return to racing. That return came in 1933 after Jakob Werlin, who served as Mercedes-Benz’s liaison with the Nazi party, convinced the German Ministry of Transport to subsidize the company’s Grand Prix efforts to the tune of half-a-million Reichsmarks per year. Though that money would later be split between Mercedes-Benz and Auto Union, it still provided sufficient incentive for Mercedes-Benz engineers Hans Nibel and Max Wagner to begin work on a modern aerodynamic racing machine, the W25, powered by a 3.36-liter 32-valve supercharged double overhead-camshaft straight-eight located ahead of the driver. As before, Neubauer led the racing team, and while he couldn’t get Rudolf Caracciola to immediately return to the team due to an injury, he did get Manfred von Brauchitsch, another proven Mercedes driver, to sign with the team again. Despite promising early tests, the W25 wouldn’t be ready to actually start a race until June 1934, when Neubauer and his team showed up at the Eifelrennen at Germany’s Nürburgring. On the eve of the race, the Mercedes team discovered that the weight of the W25 was one kilogram above the 750 kg regulation. Apparently, weight control had been neglected somewhat during the repeated modification work. On the night before the race, everyone was in a somber mood, as they all knew it would be almost impossible to shed one kilogram. It was then that von Brauchitsch shouted in desperation, “How about filing down the paint?” This inspired Neubauer, and the team worked throughout the night, carefully filing off and polishing the aluminum skin until they had barely succeeded in reducing the weight by one kilogram. 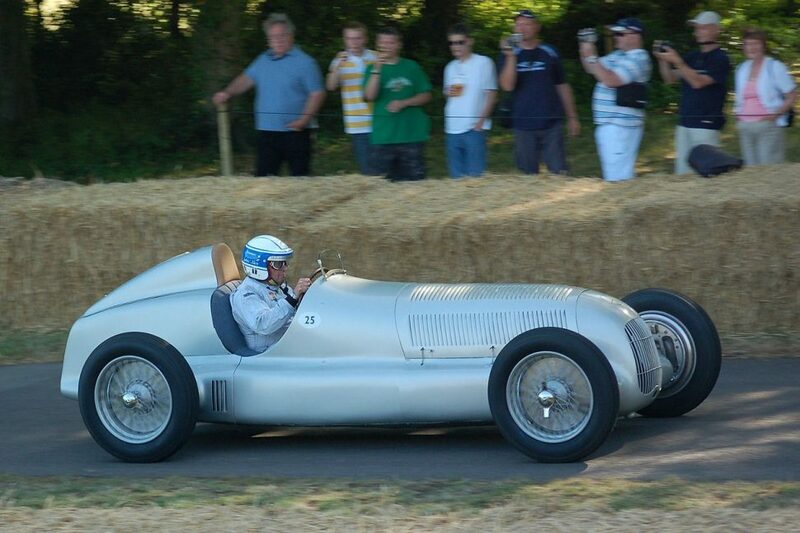 From then on, the factory color of Mercedes became metallic silver, and the race cars were nicknamed “Silver Arrows.” Auto Union, too, decided on the same silver color, eventually making silver the national racing color of Germany. After the war, Porsche painted its race cars silver, too. A critical reading of that passage should raise all sorts of red flags. If the team had indeed neglected weight control on the cars, it shouldn’t have caused them much consternation to find a kilogram here or there. And if it were up to the racing teams to decide their nation’s racing colors, it’s far from likely that Auto Union, furiously competing against Mercedes-Benz for Nazi Reichsmarks, would just go along with whatever color Mercedes-Benz haphazardly chose. Instead, as Capps pointed out, AIACR assigned racing colors to the various countries in 1908 or thereabouts: France got blue, Belgium yellow, Italy red, the U.K. green, and Germany white. However, due to white and silver sharing the same heraldry tincture, Mercedes-Benz had a long history of using the colors interchangeably on its race cars. Indeed, as historian Doug Nye pointed out, von Brauchitsch’s silver-painted Mercedes SSKL was described as a “Silver Arrow” in 1932 and a Mercedes-Benz press release from March of 1934 used the same terminology to describe the W25. Neither Capps nor Nye are the first to call the story out. In fact, Daimler-Chrysler convened a symposium in 2007 to discuss that era and to open up the company’s archives to historians. However, despite the evidence to the contrary, Capps said the company – which celebrated the 75th anniversary of the Silver Arrows in 2009 at the Pebble Beach Concours d’Elegance – still includes the Neubauer myth on placards at its museum, and the company continues to repeat the myth in current press and promotional literature. Which is not to say Capps concedes. Instead, his talk at the IMRRC, which he describes as a followup to the 2007 symposium, will delve into the evidence that debunks the myth and show how automotive historians go about researching such topics. At l'art et l'automobile, we have followed every kind of auto racing for decades, and a shining silver star crowning most of the Auto Racing Circuits has to be the racing teams of Mercedes-Benz. Their power, technology, teamwork and that iconic silver paint shine so brightly on the racing world, that many teams and manufacturers are forced to do everything they can just to pull themselves from that shadow. In honor of the Manufacturer's prowess, we have gathered all of our Mercedes Artwork and Memorabilia into one collection, and present them here to you. Enjoy looking through the collection and tell us which pieces you would like to own. 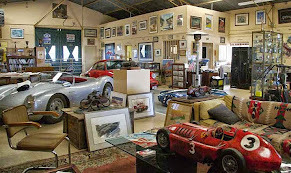 Please Tour the gallery at arteauto.com, and perhaps add a piece to your collection.